With the large amount of “free programming” that goes over air, there is a greater demand to make use of the over-the-air TV antenna. Some people mount systems to obtain HDTV. In fact HDTV obtains a clearer picture when it travels through the air compared to through satellite or cable. This is because HDTV becomes squeezed when it passes through a cable. 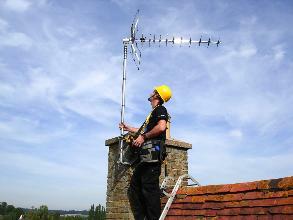 Installing and picking a UHF TV or VHF TV antenna can be confusing. Here is some advice to follow. When choosing the appropriate UHF TV or VHF TV antenna it is advisable to visit a website known as CEA (Consumer Electronics Associations). All that is required is to type in a post code and then use the map. This map will produce a list of various TV stations along with the compass locations related to the “transmitting towers.” The TV station desired will be color coded. This color will then be used when choosing a TV Aerial. It is important to take note of the fact that not every “analog” TV provider will use UHF for HDTV broadcasts. In addition, when installing an aerial in the attic it would be advisable to choose a longer type of range “TV antenna.” This is because half the antenna reception will be lost as the signal needs to penetrate the roof. In this case, a signal booster or set back amplifier should be added. The spikey antennas such as the Log-Periodic or Yagi systems are a better choice compared to the Type of antenna which are round and omni-directional. This is because each of the spikes act like tuned dipole antennas that have been optimized for specific frequencies. However, there actually no difference when it comes to a non-HDTV and a HDTV antenna. What are really important are the gain, direction and frequency. VHF UHF TV antennas that are installed outdoors are typically preferred for receiving HDTV and off-air TV signals. As long as the homeowner does not impede on historic or safety preservation and the aerial does not reach past twelve feet above the roof line of a house, then they are legally permitted to use an outdoor “TV antenna “for the purpose of “Free TV” reception. However, some homeowners or homeowners associations disapprove of this look. In this case it is advisable to use an “loft” TV aerial along with an “indoor” on.